Severn School | What Can We Learn from a Terrapin? What Can We Learn from a Terrapin? 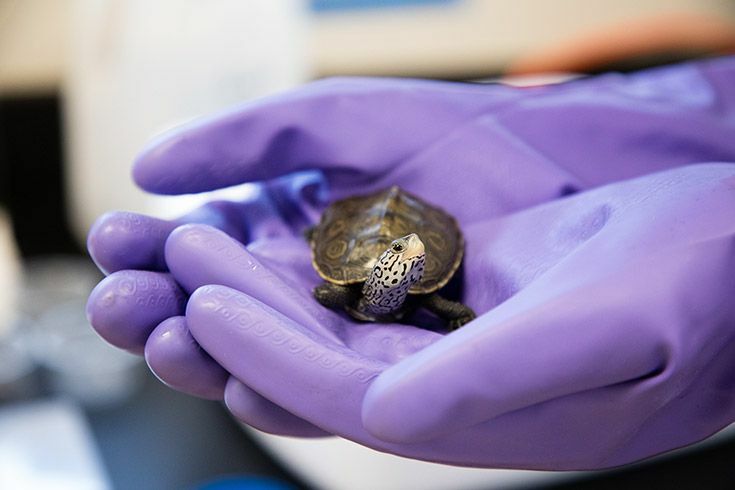 This past September, we welcomed our newest Admiral to Severn School, a tiny terrapin from the National Aquarium’s Terrapins in the Classroom program. Both our 1st and 8th-grade classes have participated in this program over the years, giving a “head start” to hatchling terrapins before releasing them to their home on Poplar Island in the spring. This program supports the health of our local ecosystem and brings us together as a community. So what can we learn from a terrapin? As it turns out, quite a lot. After a few weeks for our terrapin to adjust to its new home, 8th graders in Ms. Josey’s science classes begin feeding and tracking the growth of our new reptilian friend. 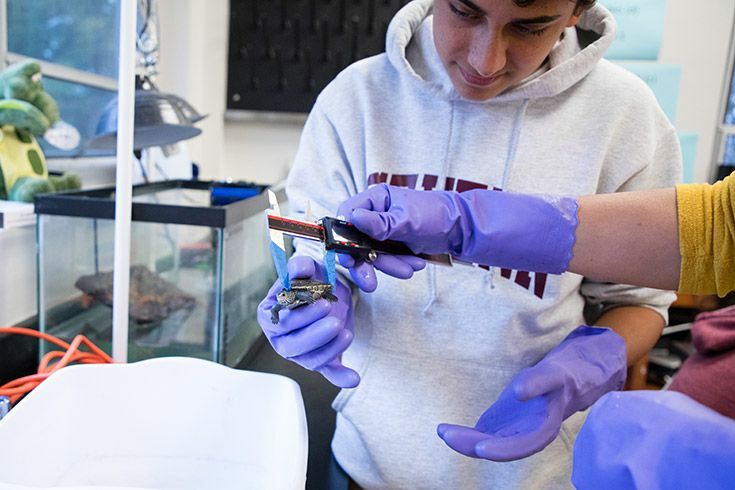 Students measure food, feed the terrapin and use digital calipers to measure its growth. They keep track of any changes and will submit this scientific data to the National Aquarium as official documentation for the program. Learning to measure with digital calipers. Ms. Josey also teaches our 8th graders about the Poplar Island restoration project and how rebuilding the terrapin population plays a part in the overall health of the Chesapeake Bay. At the end of the year, a group of these 8th graders will return the terrapin to Poplar Island and release it into the waters where it was hatched. 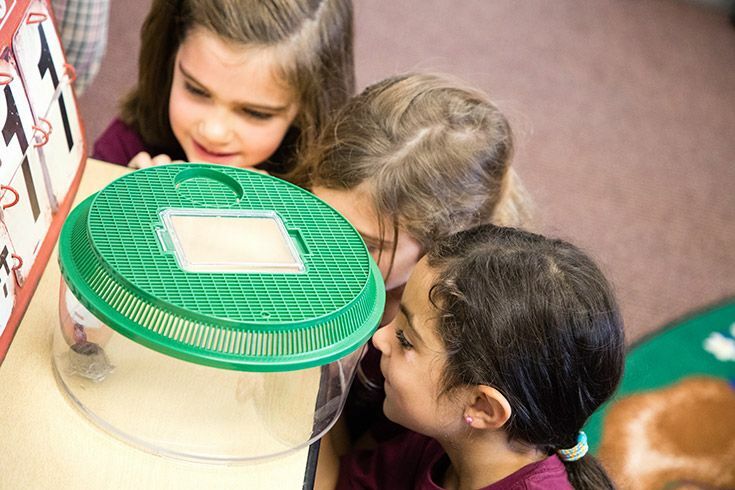 As our students interact with the terrapin and learn about local environmental issues, they develop a connection — a sense of empathy — for the living creatures that are impacted by our actions. The baby terrapin also travels to Chesapeake Campus to visit with our 1st grade. Ms. Josey, Ms. Wong and Ms. Custer talk to the classes about the Chesapeake Bay and the animals that live in and around it. Each student then observes the hatchling, making note of any special markings or characteristics. Our first graders get close to observe the terrapin! 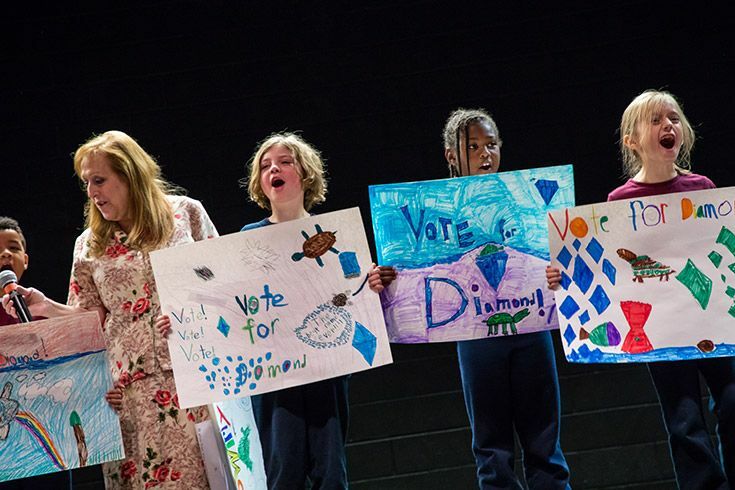 Once the preliminary work is done, our 1st graders present their speeches and posters followed by the 8th-grade ballot vote. It’s a great way to build camaraderie between our Middle and Lower Schools — our 8th graders support and model good audience etiquette for our 1st graders, while our 1st graders gain confidence presenting to their older peers. Which name would you pick, Diamond or Swirly? And now, we are pleased to officially present Swirly, a tiny terrapin who teaches us about community and sustainability — our connection to each other and to the greater world. Through meaningful acquaintances and interactions one builds understanding and respect. It follows, then, for one to build respect for the earth, one must know and see value in it. We provide our students authentic experiences with the natural world and foster a sense of responsibility for our local ecosystems and an understanding of our impact on the global environment. 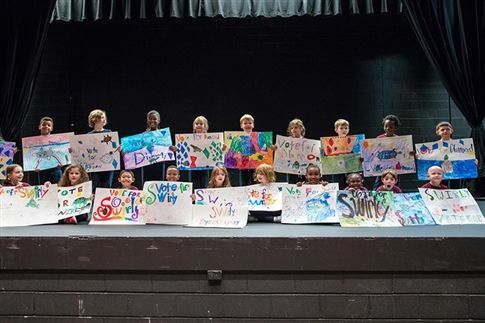 Severn School first graders present their posters!